The animated band’s guitarist teased possible new music on Instagram. 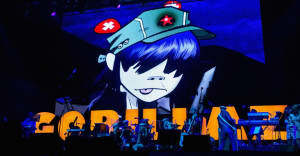 The animated band Gorillaz has been steadily dropping hints about an upcoming new album: in July, band co-founder Damon Albarn said the group's fifth album "should be ready fairly soon," followed by multimedia stories featuring two of the animated band members, Noodle and Russell. Today, the official Noodle Instagram account shared the above post. Check it out above via Exclaim!. It's a drawing of the logo for the creative collective Soulection, which will air a program on Beats 1 radio this Saturday, October 22 from 7 to 9 p.m. The show will be hosted by Gilles Peterson, who is also tagged in the post. A representative for Gorillaz declined to comment when reached by The FADER.